Wars, foreign policies, economic meltdowns, immigration laws, state of the union addresses, military budgets, pomp, closed door meetings, state secrets, police forces, fear, all point to what Jesus referred to as the Kingdom of the World. It is a world of “power over” others, as Greg Boyd describes in his book, The Myth of a Christian Nation. Power clings to power, wealth builds protection around itself, and for good reason. Those without power, without wealth, sometimes what to tear down, or at minimum call into question, power and wealth. And for good reason as well. Power over others inevitably leads to cruelty and death, to loss of fundamental rights and freedoms, and to official lies and false promises. “Power over” also produces tactics of self-protection, including violence and overwhelming force. A lot of people claim to like or even love Jesus. I would guess that many, maybe most, of those people also cling to and justify kingdom of the world ideologies. We have a tendency to seek security and comfort. We we often give up many freedoms as long as we are promised personal peace and prosperity. We like the example of Jesus, but all too often fall into the trap of believing in the safety of “power over” social structures. Sometimes, however, people rise up to challenge “power over” assumptions. The first three videos below, from Press for Truth, were made in the weeks prior to the recent G20 Summit that took place in Toronto. The fourth video documents some actions at the summit, including members of the Black Bloc causing property damage, and large numbers of police harassing protesters in the official protest zone. The fourth video also asks the question of whether disguised police infiltrated the Black Bloc and helped to lead some of the riots in order to justify other police actions and an enormous security budget. The news reported that the protest riots got out of hand at the summit. Hundreds of people were arrested. I find these reports fascinating. Clearly, the use of violence is exactly not in the tradition of Jesus. 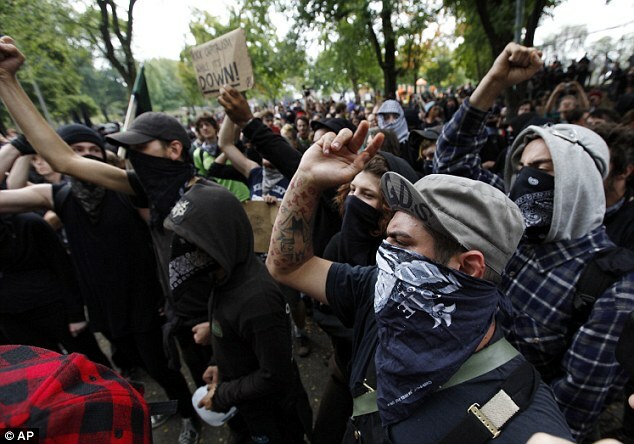 In fact, the Black Bloc is committed to a “power over” position as much as the bankers of the WTO or the IMF, or the police forces they so love to hate. Their use of violence, regardless of anything else they might say, gives them away. But the others, those that seek a new paradigm through peaceful protest (that is designed to publicly call into question the prevailing ideologies), are living, at least in part, within the tradition of Jesus – even if they would never call themselves Christian or darken the door of a church. 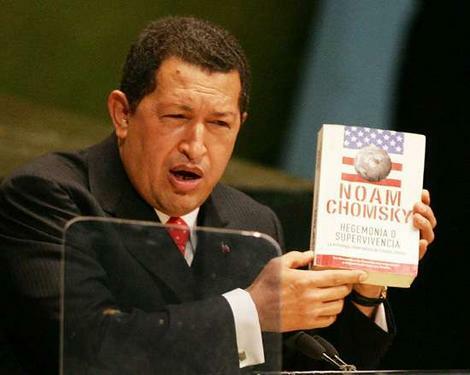 >Chomsky on the roots of libertarian socialism in the U.S. Although I have yet to research the history that Chomsky talks about, it seems to make sense, and it highlights how much things change over time and how much we tend to lose touch with our past. I find this fascinating. >John Zerzan lives in Eugene, Oregon. He is an author, speaker, and the host of AnarchyRadio. I have only recent discovered Zerzan, but I like a lot of where he is coming from. Here is a lecture from Binghamton University on April 2, 2008. * Grabbed from Essential Dissent. Discovered by way of Jesus Radicals. >I am reading the book Greenpeace: How a Group of Ecologists, Journalists, and Visionaries Changed the World by Rex Weyler, and thoroughly enjoying it. I have to say the more I learn about Greenpeace the more I like them. And like so many other things in my life, I think I know something until I start reading about it, then I realize what I assumed turns out to be different from the truth, or at least a skewed facsimile. Also, I recently came across this video of a Greenpeace direct action campaign in England. I would encourage anyone to take the time to view it. Not only do I like their spirit, but there is something fundamentally human about what they did. As a parent I look to the future for my children and I wonder what kind of world will they live in, and will that world be one where greed, power, and selfishness prevail, or will it be a world where the basic needs of human life take precedence over corporate profits? It’s easy to get sappy, and I can’t say I’m an expert on either global warming or pollution, but I have to say one thing my MBA taught me is that you cannot trust any publicly traded corporation to willingly diminish it potential profits for the sake of my wellbeing, your wellbeing, or the wellbeing of my children and yours. >brother can you spare a taser? >We glorify the protests of the past. We have seen (or remember) the civil rights marches, the sit-ins and other actions. We remember the anti-war movement. We remember May 1968 and other important dates. But where are we today? Remember the huge global anti-war protests just prior to the invasion of Iraq. Or the mass protests at the Republican convention. Remember the police crackdown on the protesters? It was like clockwork, surgical, carefully crafted like extraordinary rendition. 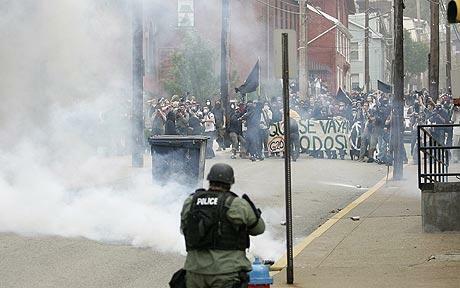 But it also got violent at times – the anti-riot police were the ones who typically led with the violence. And recently we saw the same thing at the G20 protests in Pittsburgh. But, like the protests of the romantic past, we once again wonder at the role of the police and the individual choices of each officer. Check out this video and ask yourself what is really going on. Now read this excerpt from a news report on National Public Radio regarding the G20 summit and, specifically, the protests outside the summit. ROBERT SIEGEL (host): And have the protests been going on throughout the entire city? SCOTT DETROW (on scene reporter): They have. After the tear gas, the march broke into many small groups. It stayed out of downtown, from what we can tell. Police are responding by breaking up these clumps of protesters. I saw one after the tear gas was fired. They were peacefully marching down the street and police officers swarmed the block from all directions. They got out of the car and they just pushed the protesters into side streets, and that’s what they’ve been doing. There have been arrests here and there, we’re hearing from other news outlets. But that seems to only be happening when marchers are directly confronting police officers. For the most part, police are just trying to show a presence and trying to get these marchers to break up on their own. I find both the video clip and the NPR report fascinating, not because they are anything special, but because they say a lot about the structures of power that we have come to view as normal. But should they be normal? Consider the situation: A group of representatives from the richest and most powerful nations on earth come together to discuss the future for all of us. But the the G20 has been around for some time already and the world is in trouble with widening gaps between rich and poor, increasing corporate control over such basic things as water rights, food distribution, farmer’s crops, and of course the economy. In fact, it could be said the recent bailouts of large companies around the world represent a kind of coup d’état. It may just be that the current economic crisis (and the steps to remedy it with tax dollars) is evidence of the increasing loss of real power on the part of the government (a government of the people) over the economic/big business sector. MICHAEL MOORE: We’re here to get the money back for the American People. Do you think it’s too harsh to call what has happened here a coup d’état? A financial coup d’état? MARCY KAPTUR (Representative from Ohio): That’s, no. Because I think that’s what’s happened. Um, a financial coup d’état? MARCY KAPTUR: I could agree with that. I could agree with that. Because the people here really aren’t in charge. Wall Street is in charge. Given our democratic ideals the situation looks grim. One could easily see the recent election as a kind of sham (as are most elections but especially this one), a game those in power managed in order to help all of us feel like we participated in their power play. Maybe democracy as it’s been sold to us is a way to tie us up with mythological fairly tales so that the powerful few remain in power. 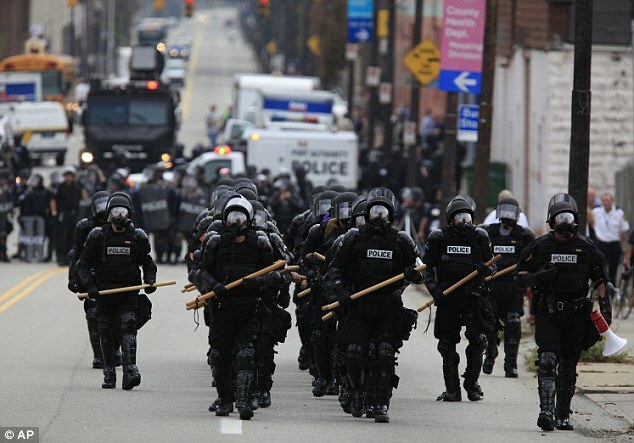 So why would not people peacefully (or even angrily) march down the streets where the G20 is being held to protest? And why wouldn’t those marchers see the police as something like turncoats? Why does our society accept as normal such activities as the use of tear gas, batons, knocking people to the ground, tasers and rubber bullets, and now anti-riot siren devices, by police against weaponless, non-violent protesters? What is the psychology? I won’t pretend to have the answers to these questions. However, when I see the way the police in this country deal with protesters I cannot help but be reminded of some very famous sociological studies, horrific events, and historic observations. My point here is not to equate actions so much as highlighting the way the human mind works in various situations. Milgram experiment: Showing that people will do terrible things as long as someone (preferably someone “official”) tells them to. Stanford prison experiment: Demonstrated the impressionability and obedience of people when provided with an apparently legitimizing ideology along with social and institutional support. My Lai Massacre: Showing that individuals are capable of anything when part of a group, following orders blindly (as soldiers and police are trained to do), and operating in a tense situation outside of normal experience. Banality of evil: Hannah Arendt’s observation that evil acts are most typically carried out by ordinary people viewing their actions as normal. Social influence: How we are all greatly influenced by others around us, the situation we are in, and tendencies we have toward self preservation, being liked, and not being stigmatized. I have come to believe the actions of police toward protesters reflects aspects of all these sociological and psychological characteristics found in the list above – though to a substantially lesser degree in some cases. But there is one other factor that possibly plays to largest role, that of hegemony. Now hegemony is a good college level word for why people acquiesce, and even embrace, the power structures that control, and even sometimes enslave, them. If you did not study the word in college you may remember when Hugo Chavez touted the book Hegemony or Survival: America’s Quest for Global Dominance by Noam Chomsky when he spoke at the U.N.
Chavez aside, the concept of hegemony, first proposed by Antonio Gramsci as a way of trying to understand why the working classes did not rise up against their oppressors as the Marxists predicted, is a way to understand how the powerful persuade the less powerful to adopt the values of the ruling class. We live in a country that denies the existence of class structures in terms of power. We speak of middle class or working class merely as sympathetic terms used by politicians to manipulate votes. We do not accept the concept of a ruling class, but maybe we should. In the videos on this page look at the faces of the police (the ones not wearing Darth Vader masks). There is a lot of anger in their eyes. I wonder if the anger comes from an internal struggle. I can only hope. I imagine the police feel a tension between the hierarchies of power they have come to believe must be protected (of which they are sworn to uphold) and their deeply internal sense of humanity and their belief in democracy (an understanding of which was probably formed in grade school like it was for most of us). They are caught in the clash of values, but they are a group operating with broad impunity and supported by the social dynamic of being able to hide within the apparent pawnship of their job. So they continue to manhandle, arrest, and attack the protesters. But their anger gives them away. They are alienated from the power they protect, and suppressing the very voices that are pointing out that alienation. That would make just about anyone angry. Consider this video of another protest. If not for the police intervention it would almost be humorous. I cannot imagine a less threatening protest. In fact I find it almost comical. Why then the overwhelming police force? Are they afraid of another Battle in Seattle? Clearly this is an example of those in power acting out of fear, but what do they fear? In fact, the whole thing has a kind of choreographed arc that not only speaks of a profound lack of imagination on both sides, but indicates the protest may be as much a product of hegemony as the police presence. What do we do with all this? First, we should not romanticize the past. The efforts of the civil rights and anti-war movements of the past were often heroic, but they were also brutal and scary at times. People were seriously hurt and some died. Many went to prison. And we should know that external actions come from what is inside, but also know that one’s external actions affects one’s soul. The police who give in to the psychosis of power, abuse other humans, act out of anger, and stand in the way of freedoms that are not given by governments but only taken away, those police are damaging their own souls. And they are human just like me – frail, prone to delusion, living in a powerful culture, needed to be loved, and wanting to do what is right. We should not feel sorry for them, but we should empathize. The fact is many of the above sociological/psychological concerns raised about police action can apply to the protesters. At times it appears some of the protesters are seeking to recreate a May ’68 kind of experience for their own pleasure. I wonder how many made the effort to reach out to the police in the days or weeks prior to their marches. I wonder how many pre-judged the police as irredeemable, in part because it is both the easier route and less romantic than manning the barricades. This is one reason that, while I support the protesters in general, I think the predictable protests outside every G20, G7, World Bank, etc., meeting may be as much a symbol of failure as righteous anger. We need more than theater, we need transformation. Finally, we are all in this thing called life together, whether we want to admit that or not. It’s easy to march, easy to crack skulls, and very easy to write blog posts, and it’s difficult to love, forbear, and forgive.